BREAKING NEWS! 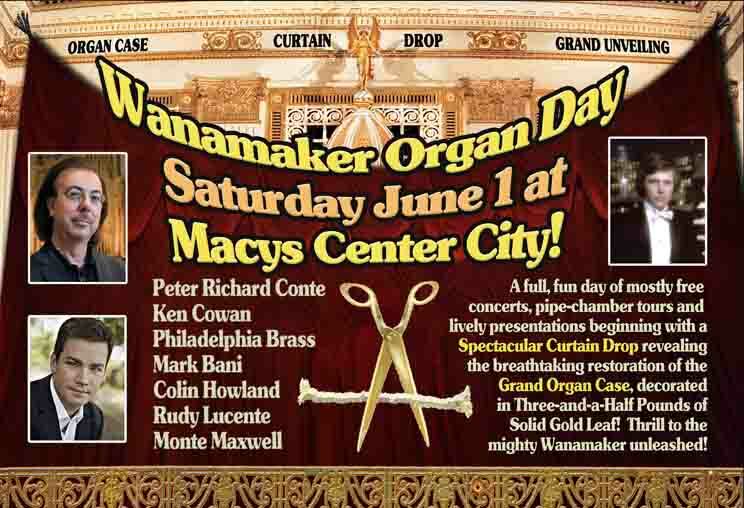 Wanamaker Organ Day is Saturday June 1 and opens with the unveiling of the Grand Organ Case, presently being completely restored by EverGreene Architectural Arts with pipes gilded in 22-karat gold! 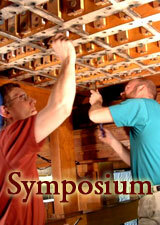 The day opens at 9:15 am with a thrilling Rick Seifert presentation on the Wanamaker Organ held in Greek Hall. Then at 11 the Grand Organ Case will make its debut with a dramatic reveal hosted by Macy's and the Friends. Included is a spectacular concert with Peter Richard Conte and fanfares by Philadelphia Brass. At 2 pm the action shifts to Greek Hall and a special Bernie Anderson Wurlitzer presentation honoring the 115th anniversary of the St. Louis World's Fair. Look for music from the landmark MGM musical "Meet Me in St. Louis"! Bill Bragg emcees! At 5 pm Mark Bani, Colin Howland, Rudy Lucente and Monte Maxwell join Peter Richard Conte to present a musical tribute to Keith Chapman. 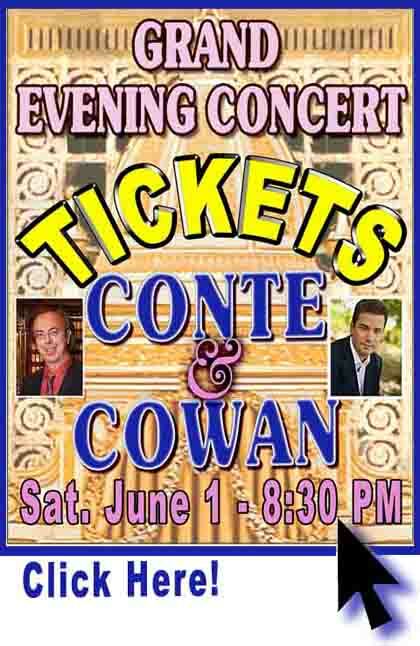 Then at 8:30 in the the Grand Court, Peter Richard Conte and Ken Cowan star in our Grand Evening Concert, held in the perfect hush of the closed Store, when all the fine details of the Organ can be heard and its full majesty can be unleashed. Conte plans to present his electrifying transcription of Elgar's Enigma Variations, including the famous "Nimrod"---making thrilling use of the lush String organ. Cowan is playing thrilling Romantic masterworks by Maurice Duruflé, Hector Berlioz and Richard Wagner. Plan now to be a part of this historic occasion! Plan to come a day early as we will be offering free chamber tours Friday as well as the usual daily concerts at Noon and 7 pm. For a wonderful story with pictures on Emily Eichelberger's Wanamaker Organ wedding to her husband John Pyle please click HERE! To renew, please click the icon a the top. To make a donation, please click HERE! To join and receive our newsletters, please click HERE! We have many vital restoration projects in the pipeline, including the entire Solo division and the restoration of the pipe facade, together with a centennial celebration of the first Stokowski/Philadelphia Orchestra Wanamaker Organ concert Saturday September 28. Check this space for details! Thank you for your generous support of our important cause! Click the icon above to enjoy a highlight from our Rachmaninoff CD, which was hailed by The American Organist: "No less than spectacular....Of all the recordings of these beloved works, this one is unique,and entirely compelling. It stands with the many orchestra recordings on the market, and exceeds some, for its artistic merit and impact. It allows us to hear the music in a new, satisfying way." How you can help with some very special projects! Join (at our webstore) or renew now (at the top of the page) to get all the exciting details as this major restoration project unfolds! Please watch this space for more concert-date announcements, which will be posted as soon as we receive them. Because our special concerts are dependent on Macy's sales schedule, precise dates are given to us generally about 10 weeks before certain concerts. All members receive timely announcements of our events and details in our quarterly newsletters! Michael Lawrence's article on restoring Fleming pneumatics is available at this blog, which has fascinating observations on music and music making. Details are HERE! Curt Mangel was honored for his saving of the chandeliers of Chicago's Uptown Theater, now undergoing a major restoration. Watch HERE! Hear the Cornell Glee Club at Macy's Grand Court HERE! Nick Meyers showed off the Cornet of our beautifully restored Original String Division. Highlights are HERE! Enjoy a YouTube sneak preview of the new Wanamaker Office Building video wall, paying tribute to the Wanamaker Organ. Click HERE! HEAR MENDELSSOHN'S WEDDING MARCH from a Grand Court Wedding Sept. 13. Watch HERE! Orders for the Rach CD may be placed clicking the TOP banner. Enjoy a free sample by clicking the lower bar! 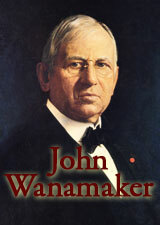 Wanamaker Organ Day videos are available HERE and HERE and HERE, thanks to Friends member Bill Theobald! MONTHLY TOURS HAVE RESUMED! Admission to our monthly last-Saturday-of-the-month Organ Tours are available by appointment. Secure your admissions clicking HERE and meet your tour guide Nik Sizgorich at noon at the Eagle on the day of each tour. 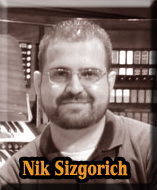 After the noon concert is finished, Nik will then take ticketholders on the tour. Included in the tour is the Friends Museum, which includes first editions from the personal library of organ architect George Ashdown Audsley, all of his own works, placed on deposit with the Friends. The actual Leopold Stokowski 78 rpm record that inspired Virgil Fox to arrange "Come Sweet Death" may be viewed, as may the medal Dr. Audsley received at the 1904 St. Louis World's Fair, and a silver tray given to his father in 1838. Other exhibits include documents signed by Rodman Wanamaker, and memorabilia pertaining to Wanamaker Organist Keith Chapman and former curators. PRIVATE TOURS are available year-round by appointment when guides are available, but may incur a significant extra charge to cover the expenses of securing a guide. (We are a small organization and do not have a tour guide staff on site.) Cost per person is $18 (you can use the Student Rate at our webstore to secure admissions). The cost of securing a guide for a private tour depends on what is negotiated with the guide, who is paid his or her fee in person and usually travels into town for the sake of giving the tour. Please try to give us as much advance notice as possible. ALSO NOTE: There are no regular monthly tours in November or December because of the Christmas Light Show. TWO SECTIONS of the Wanamaker totalling almost 10 percent of its sonic resources have undergone complete restoraton: The 24-rank Choir Division and the 18-rank Original String Division. Both of these sections in the Original Organ are filled with dozens of the softer voices. Included are four wonderful restored reeds that will add their magic---particularly in our after-hours concert when the Store is closed. 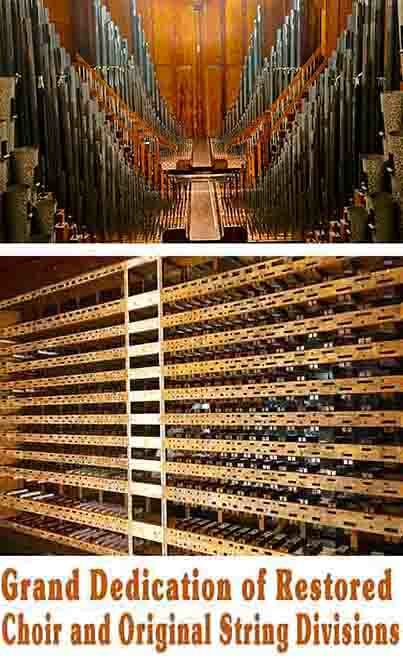 The Choir is fully completed and will be best heard when its expression system is restored later this year. The Original String is close to completion with pipes presently being installed. Full details are in our forthcoming Fall newsletter. Please note that our monthly organ tour requires tickets. Details are below. Please also patronize our webstore, which helps support our musical mission. Immediate Direct Shipping on all Orders! Buying from us helps support the cause of the Wanamaker Organ! Our membership renewal period is still in full swing. We rely on donations from people like yourself who understand the complexity of the Wanamaker Organ and all that is required to keep it playing to accomplish our mission. Increased giving makes us eligible for increased grant amounts. For early birds and those who want to join or renew online, please click on the Membership Renewal box at the top of the page. 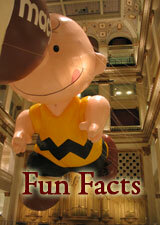 We deplete ourselves of funds each year for the cause of the Wanamaker Organ. Please remember that all we do is directly dependent on the generosity and financial investment of our members. The selection of Premium Gifts includes two Double Premiums found only online...Items M and N (which were available in previous years). Thank you all for your support as we enter our 25th year supporting the Reigning Monarch of All Instruments, with much important work ahead of us! OUR LATEST DVD! Immediate Shipping! Ever wonder what it is like to sit down and play the Wanamaker Organ? Our exciting new DVD, The Wanamaker Organ: A Sonic Odyssey, is now available! Just click on the icon at left to secure your copy. Peter Richard Conte and Yale organist Thomas Murray go through the Organ's formidable resources in a fascinating, fun, three hour film full of insights from two master musicians. A companion to our Curator's Tour DVD. Orders are being shipped immediately since stock has arrived. An enclosed booklet includes registration and playing insight from Conte, Keith Chapman, Virgil Fox, and more! 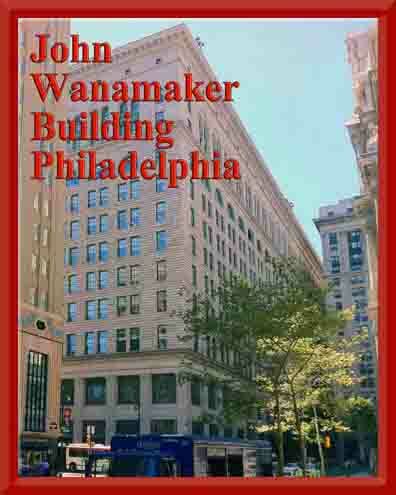 Read Peter Dobrin's marvelous tribute to the Wanamaker Organ in the Philadelphia Inquirer HERE. Writes Dobrin: Whatever your taste, this is music of the best sort -- music you didn't find, but that found you. Many first-time visitors ask about whether there is a charge for the daily concerts, or if special preparations are needed. The answer is a simple no. The Wanamaker Organ plays into the huge atrium of a grand department store, and the concerts are a free part of the daily Macy's shopping experience. The regular daily schedule is Here. Archived streamcasts of the monthly WRTI-FM broadcast are available HERE, and include performances by many guest artists as well as our beloved Peter Richard Conte. Please consider the Friends in your giving. Each year we start afresh, dependent on your generosity, having depleted the funds of the season before. Thank you for your consideration as we strive to grow our musical mission. Take a look at the Friends of the Wanamaker Organ film intended as an orientation for store visitors. Linked here is the most recent edit. Macy's has also put it on their official website, accessible HERE. To play the video, simply click on the illustration at right. Peter Richard Conte and flugelhornist Andrew Ennis were interviewed by WRTI's Susan Lewis HERE. An article on the Rodman Wanamaker flag collection by Karen Chernick of Hidden City is HERE. 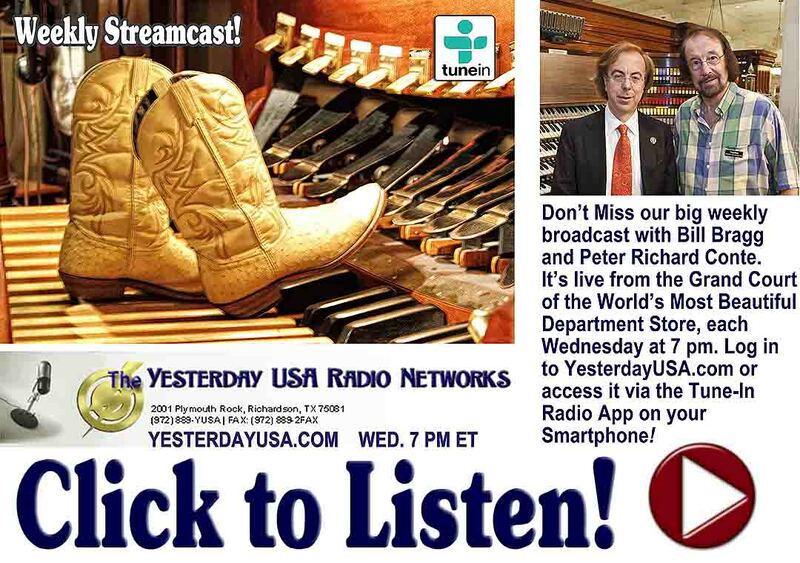 The Wanamaker Organ streamcast continues on YesterdayUSA.com in our weekly LIVE broadcasts from the Grand Court each Wednesday at 7 pm Eastern. Bill Bragg hosts! Regular membership in the Friends of the Wanamaker Organ enables us to be eligible for the special funding that allows this restoration work to go forward. You can help support the restoration and all our programs and get prompt news on our events by becoming a new Friend of the Wanamaker Organ. For just $25, new members receive our acclaimed quarterly 16-page newsletter, which is chock full of concert and restoration news and historical memorabilia, information that is only available in printed form. You can Join the Friends by clicking here or on the membership icon at right. (Members may renew by clicking the Renewal Box at the top of this page. 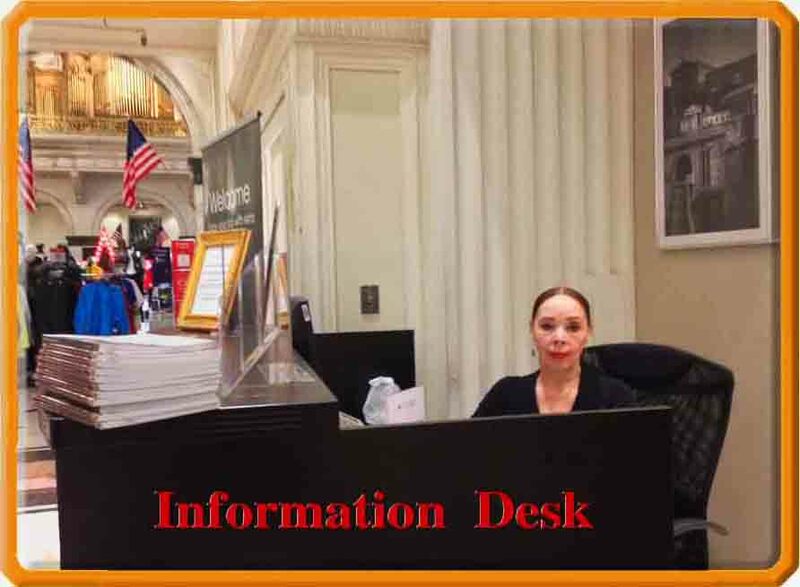 Tourist information for Wanamaker Organ visitors, including hotel and restaurant ideas and money saving tips, is available by clicking the banner below. We look forward to seeing you! Our CafePress store makes items individually as ordered and direct mails them to the purchaser. As a result, classic Wanamaker items are available on everything from posters to cufflinks. Check it out by clicking the banner above! A Philadelphia Daily News video piece is available HERE. Information on the Wanamaker Organ and the historic Store is available at the MACY's INFORMATION DESK on the Main Floor of the Center City Macy's Men's Department. At the present time, the desk has discontinued offering a selection of organ CDs, DVDs and Books as their sales system is being reviewed. You will find the desk along the right side of the center aisle just as you enter the Grand Court. The desk is generally staffed from 11 am to 6 pm, Monday through Friday, and Saturday from noon to 5pm. (Please remember that the Wanamaker Organ does not play on Sundays.) The staff prides itself on its knowledge of the Store and its heritage. Macy's has also been offering historic tours. Please consult the information below and contact Macy's to see if this offering is still available at the time of your visit. Discover the magic of Macy's Center City Philadelphia, with highlights including the breathtaking Wanamaker Building, Wanamaker Grand Court Organ and Grand Court Eagle. Plus, learn how Macy's has grown into America's largest department store with 800+ locations and over 100 years of retailing history. Tours can be customized to focus on architecture, merchandising, marketing or fashion. All participants receive a Macy's Visitor Savings Pass. Tours last approximately 45 minutes and must be scheduled in advance. For more information or to book a tour, contact Macy's Center City Visitor Center at 215-241-9000 ext. 2408. Folks who identify themselves as Wanamaker Organ tourists at the Visitors' Center and come from a distance away are entitled to a Macy's Savings Pass, so be sure to ask about that as well! Incidentally, there is no sales tax on most clothing purchases in Pennsylvania! Jennie Funches (pictured) is your host. Keep up with all the restoration news in the Friends' newsletter The Stentor. Four issues come with your membership, and are packed with restoration and concert news with historical insights and letters from other members. Please consider making a contribution here. A prospectus on the fund is available here.We are counting on this fund to create quality presentations for many years to come as we help secure the Wanamaker Organ's place in musical life in the years ahead. The icon above takes you to a page with interactive links to media stories on the Wanamaker Organ, including a recent Pipedreams with highlights from Wanamaker Organ Day, a fascinating interview with our carpenter Scott Kip, and a superb Bob Krist National Geographic short film on "The Voice of Philadelphia." H earing Philadelphia's Wanamaker Organ is a life-changing experience. 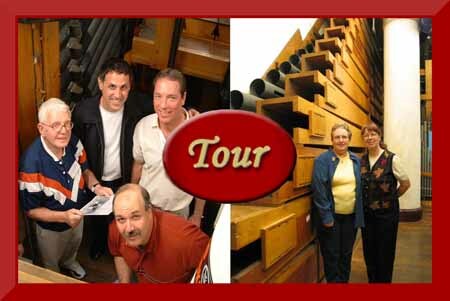 Our society is sponsored by people around the world who are helping protect the world's largest playing pipe organ. We invite you to join the Friends and receive four issues of our 16-page newsletter and member-access to all Friends activities. The Wanamaker Organ is undergoing a multi-year restoration. Divisions that have been patched together are getting a thorough restoration. Members help sustain this crucial work and our music, education and hospitality programs. Members receive all the details on the restoration and Friends concerts, as well as news of private concerts, tours, and fund-raisers, in our acclaimed quarterly newsletter, The Stentor. Macy's and the Wanamaker Organ are located at the Wanamaker Building at 13th and Market Streets in Center City Philadelphia, PA, next to City Hall. Macy's is easily accessible by SEPTA (www.septa.org), PATCO www.ridepatco.org), and NJT (www.njtransit.com) bus and rail lines to Center City, Philadelphia. 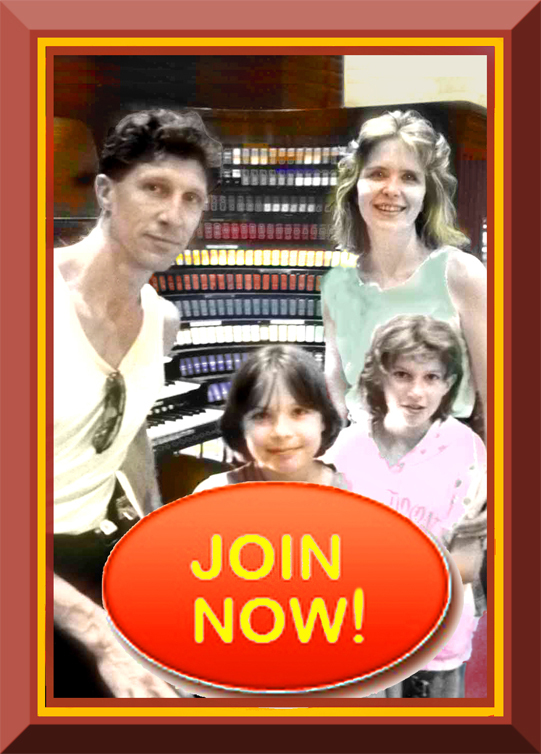 This website was made possible by people just like you who love the Wanamaker Organ and want to share that joy. Please look through our website menus for answers to all common questions about making your visit to our Philadelphia wonder thoroughly enjoyable. IMPORTANT: Are you using a mobile device for turn-by-turn directions to the Store? 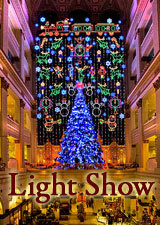 Please enter 1300 Market Street, Philadelphia, PA 19107 to reach Macy's and the Wanamaker Organ. Please do NOT enter the Friends' business address below.